From steamy casseroles to hearty soups, hot comfort food is popular everywhere it gets cold. This especially true in China, where people have believed since ancient times that one’s diet should be harmonized with the seasons. Chinese cuisine goes far beyond just good old comfort food, however, incorporating traditional Chinese medicine (TCM) into seasonal dishes and dietary tonics called 冬冷进补 (dōng lěng jìnbǔ). It is common to consume winter tonics in China, usually just as part of a meal. Chinese medicine's dietary principles are very much a part of culinary culture. Winter tonics are based on the idea that people should live in harmony with the seasons. According to TCM, winter is the most yin of the seasons, characterized by a cold, dark, slow, inward energy, which makes it a good time for meditation, self-reflection, and rest. Acknowledging the yin aspect of the season is important in TCM because the yin and yang philosophy of balance and harmony in the body teaches that in order for energy, or qi (气 qì), to be released, it must be subdued and stored for a while. In the same way that all organisms hibernate or store their energy during the winter, humans also need to rest up and preserve their energy. An old Chinese saying goes, “take a tonic in the winter, fight a tiger in the spring” (rough translation of 今年冬令进补，明年三春打虎). While fighting a tiger might be an exaggeration of the health benefits, what TCM means is that the winter is a time to lay low, and health benefits will follow later on. In TCM, the kidneys have the all-important function of storing the body’s qi, or life force, and are especially important in wintertime recovery. They are vulnerable during the winter since they can suffer from the cold, and require sufficient rest (which is why some animals hibernate during the winter). According to TCM and modern medicine, kidney health is closely related to our sense of hearing. In the natural world, sound travels much more easily through the quiet stillness of winter than it does during the buzzing activity of spring and summer, making us more inclined to use our sense of hearing during the winter. The heightened ability to hear can make us feel restful, and can help with the body’s ability to recovery in winter. The bones are also related to the kidneys, as they contribute to creating another of life’s essential energies, called jing (精 jīng). Jing can get worn out due to stress or an unhealthy lifestyle, so it is crucial to rest up and take tonics to enhance your wintertime recovery. Bone broths are a favorite winter seasonal dish in China, as they are warming and contain restoring nutrients. In China today, many people eat according to TCM dietary principles to improve restfulness and better absorb nutrients. Winter tonic ingredients usually include foods that naturally grow in the winter, such as root vegetables. Squashes, potatoes, carrots, various roots, meat, dairy products, beans, nuts, black sesame, apples, pears, and dates feature prominently in winter tonics. Almost all winter tonic dishes are served hot, as TCM is very sensitive to temperatures, which is also why so many Chinese people prefer to drink hot water. 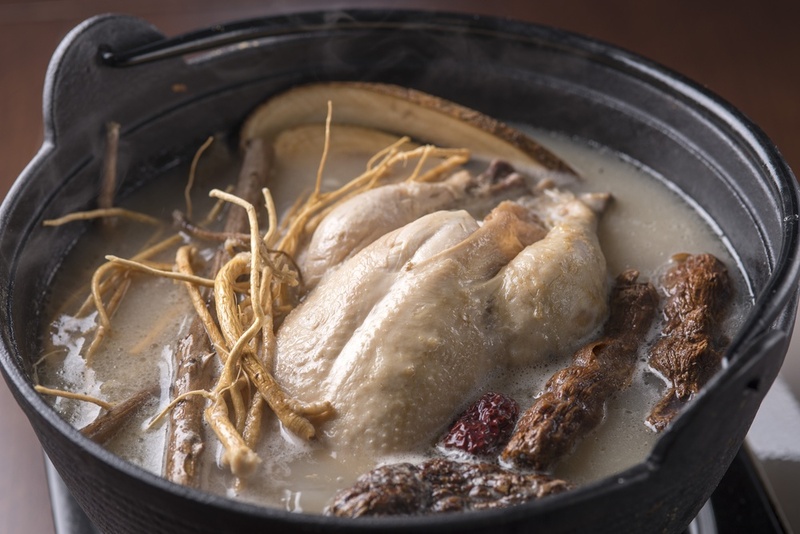 You can identify such dishes as winter tonics by their ingredients, like the ginseng chicken bone broth soup with red dates (红枣 hóngzǎo) pictured at the top. Red dates are an herbal remedy which improves digestion and absorption of tonic nutrients. Ginseng (人参 rénshēn - yes, 参 is a character with multiple pronunciations), is very important in TCM, and it helps boost your wintertime recovery, giving you energy if you feel tired, or calming you if you are stressed. Such tonic herbs also help you make the most of all the nutrition in the chicken, giving you a very satisfying feeling in your stomach after your meal. Another common Chinese winter tonic is tangyuan (汤圆 tāngyuán), consumed during the Winter Solstice Festival Dongzhi (冬至 Dōngzhì). 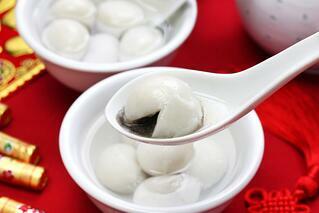 These glutinous rice balls contain black sesame paste on the inside, which benefits the blood, liver, and hair. 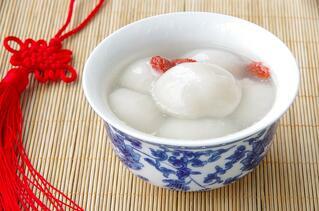 Tangyuan often is served in ginger soup with red dates. Some winter tonics are consumed as a tablespoon of paste (膏方 gāo fāng) with sugar before breakfast every morning. This paste is mixed with hot water and used more as a medicine for people with a specific health condition. Most food dish tonics, however, can be found in most restaurants, especially in northern China.